If you've met Andrew at any gaming conventions, you will know this his unlimited enthusiasm and excitement is infectious and Yay Games is suitably named! He also has a rather silly sense of humour as does Ominoes Hieroglyphs - An ancient tile laying game proves. However, his designs are wholly serious and are great family games. 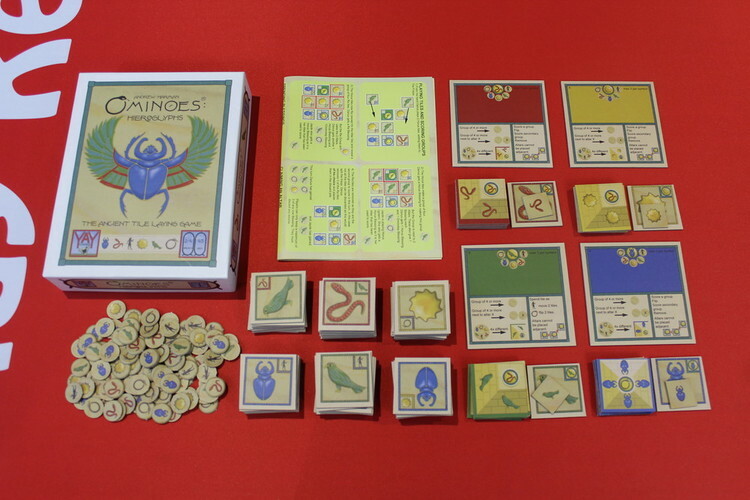 In Ominoes Hieroglyphs, players take on the role of rival priests trying to gain the favour of the Gods in order to build their temple before everyone else. 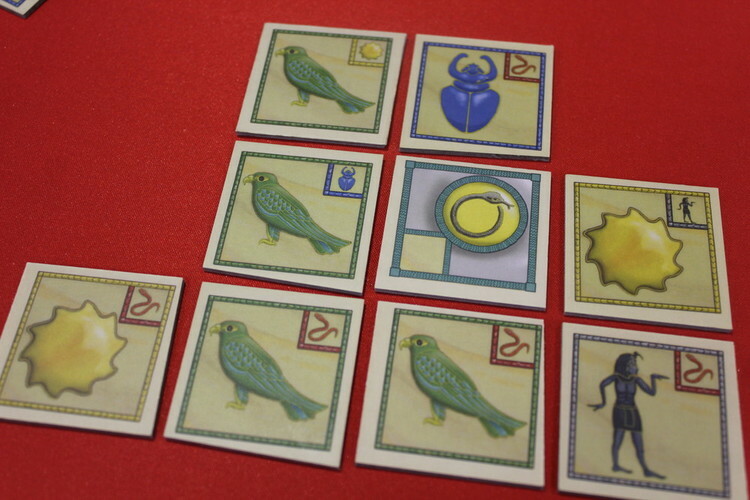 Give each player a player board, a set of five temple tiles, an altar and an altar claim tile in their chosen colour. Deal each player five random tiles, the altar makes it up to five tiles in hand. 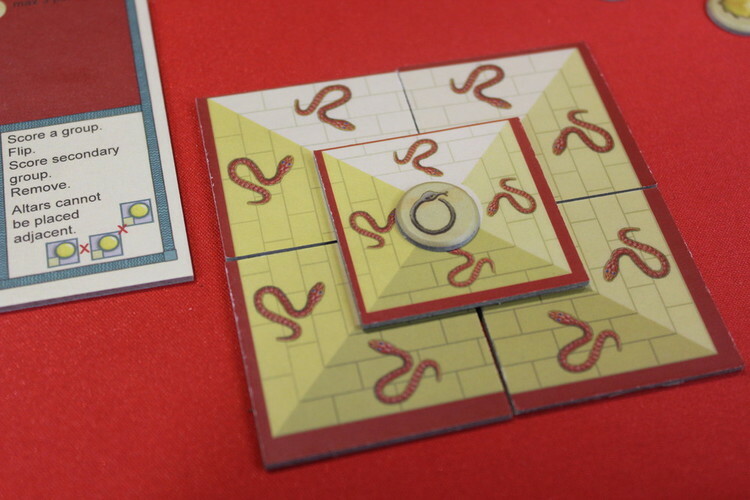 Place an altar of Ominotep in the centre of the table with a random tile of each design around it. This is the start of the Frieze of Ominotep. 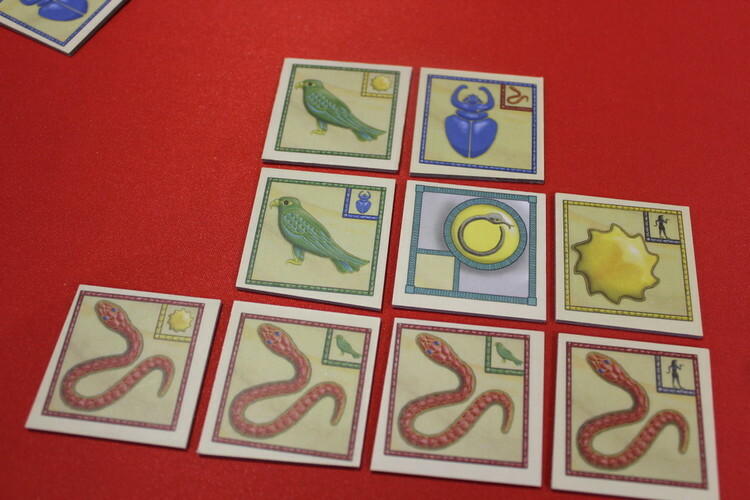 Shuffle up the remaining tiles, including any Altar tiles for the symbols not being played if you have less than four players. This will be the draw deck. If this ever runs out, shuffle up the discarded tiles to form a new draw deck. 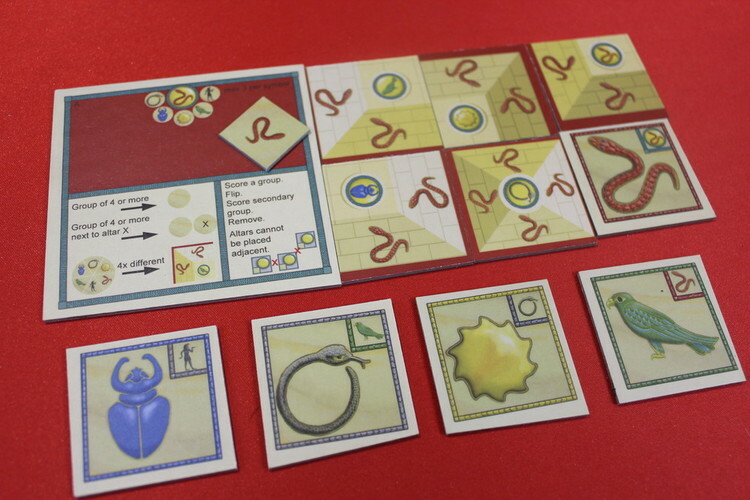 Players will take it in turns to play as many or as few tiles as they want to try and get four matching tiles. Matching four or more tiles will grant you a blessing from the Gods and that’s what you need to build your temple and that’s how you win the game! The player who looks most like an Egyptian God goes first! That player gets an additional two tiles, the second player gets an additional one. 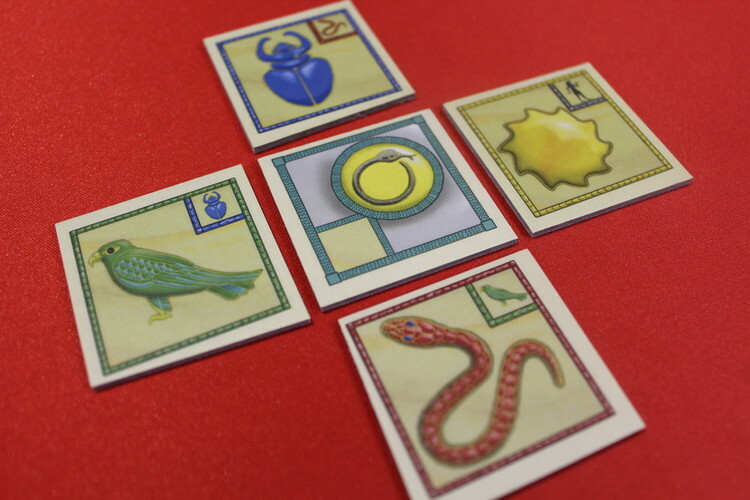 From your hand you can choose as few or as many tiles to play, as long as they all have matching symbols. Each tile can be used whichever way round you choose. Altar tiles are played as part of any tile group. Altar tiles cannot be placed next to another Altar tile. When you place an altar that is not your own symbol, place your altar claim tile in the space for it. A group of tiles score if there are four or more of the same type touching. Gain a Blessing token for each matching group you have and a blessing for any Altar tiles that group was next to. The owners of the Altars will also gain a Blessing token that corresponds to the Altar. Flip over all matching tiles. This may result in another matching group, if so, distribute Blessing Tokens again as above. If a second match occurs, remove as many of the tiles as possible without breaking the frieze. These tiles are placed in the discard pile. One temple tile can be traded for any four different blessings at any point in your turn. You may only ever have three blessings of a single type, any extra must be discarded at the end of your turn. The lower four tiles of your temple can be placed in any order, but all four must have the matching blessing placed on them before the final capstone is placed on the temple. 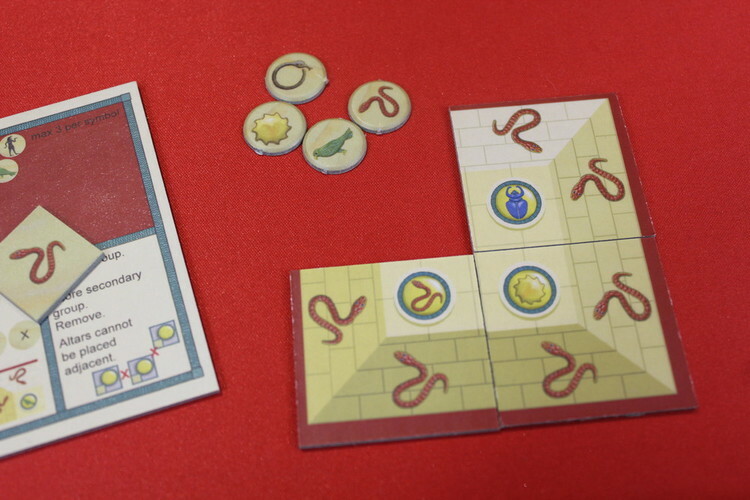 The game immediately ends when a player places an Ominotep blessing on their last temple tile. If you have not won this turn, draw up so you have five tiles in your hand again. Play continues around the table until someone wins!! Ominoes Hieroglyphs continues in the Yay Games vein of family-friendly games that are easy to learn and teach, but difficult to master. Hieroglyphs also relies less on luck and more on strategy than Ominoes as you are not restricted by your die rolls. The decision between to place a set of tiles next to an altar to get the blessing you need vs giving that blessing to the altars owner can be tough at times. This small box game packs a neat little puch!